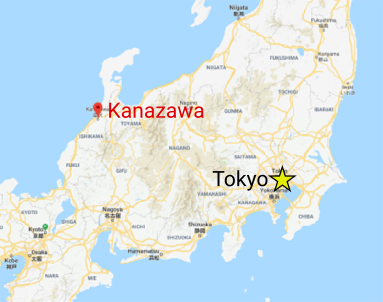 Kanazawa is located about 300km north west of Tokyo. 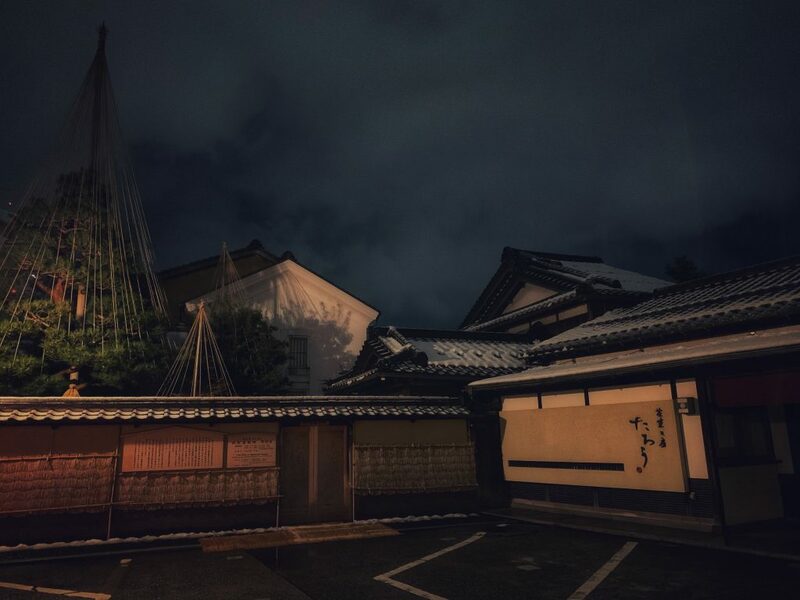 Kanazawa was spared from the air raids during World War 2 which allowed many of the old structures and areas of the city to remain well preserved (source). Hence the title of this post. Unfortunately for me, our last day in Fukui was wet. We walked around for about an hour before heading to the Shinkansen and my shoes became drenched. When we arrived in Kanazawa it was cold. Wet and cold are an awful combination and I think this may be where the illness I picked up during my last few days in Japan stemmed from. We left Fukui earlier than the other places we visited, and Kanazawa was only about an hour by Shinkansen. That meant we arrived at our next destination with time to kill (a couple of hours) before we were allowed to check in at the Dormy Inn Kanazawa Natural Hot Spring. We left our luggage at the hotel and decided to check out the area, look for food, do some shopping, etc. All the fun stuff you’d expect two young hooligans to do when exploring a new city. Kanazawa Station had a beautiful and huge gate (Tsuzumi-mon Gate) outside of the station. At night, the gate is lit up with brilliant changing lights. The gate also collects rain and snow runoff, we learned this from a scale model of the gate in the mall attached to Kanazawa Station. 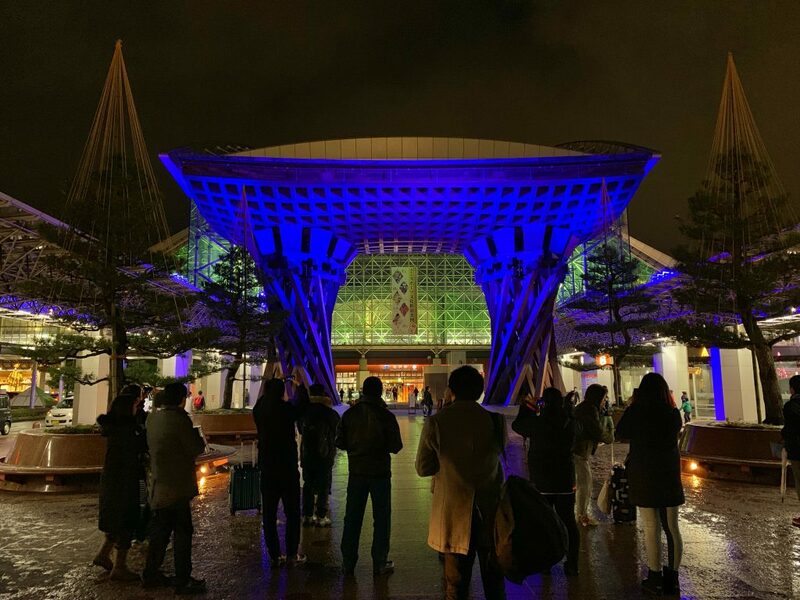 This huge gate outside the Kanazawa Train Station (Tsuzumi-mon Gate) changed colours in the evening. Here you can see the water runoff from the gate beside the escalator. Once the clock hit 3:00 pm we made our way back to the hotel. Shyla graciously allowed me to take a few hours to dry my shoes with the hair dryer in our room and take a quick nap before we geared up to explore the city of Kanazawa a bit more thoroughly. 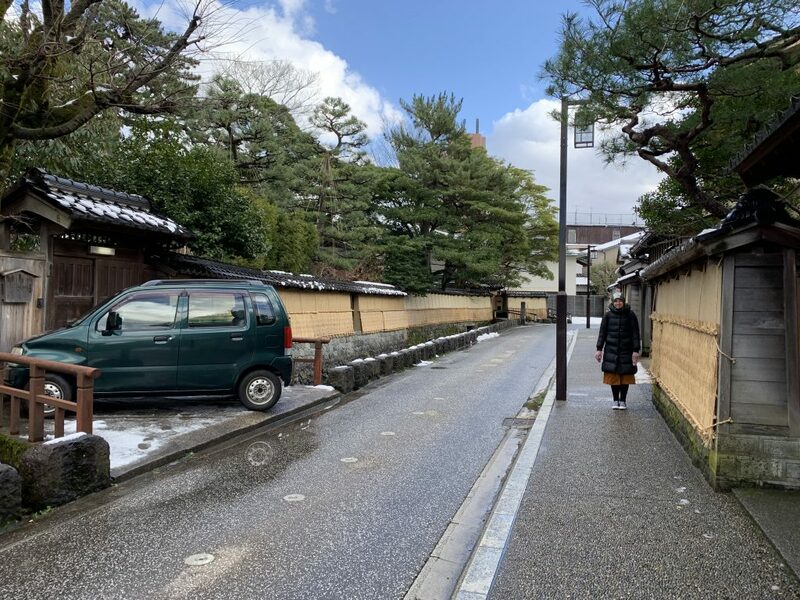 Since we had limited time in Kanazawa before heading back to Tokyo, we decided to preemptively scope out the places we intended to visit the next day, which included the Nagamachi District (a district famous for its samurai houses) and the Nomura Samurai House & Garden. One of the alleys in the Nagamachi District, picturesque. Nomura Samurai House & Garden, closed for the evening. It was dark but we managed to navigate our way through the backstreets of the city until we found both of the landmarks we intended to find. We did some further exploring without any goals in mind. 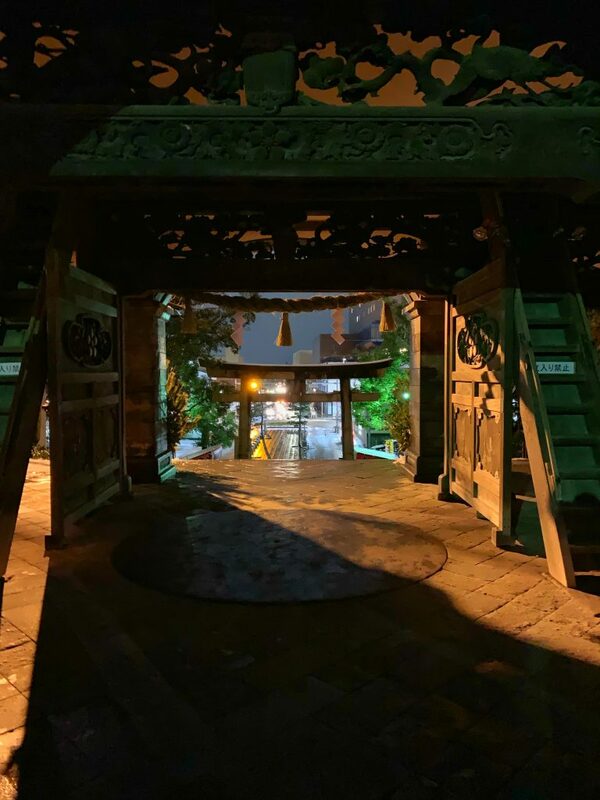 We ended up finding a beautiful shrine tucked away between the tall city buildings in a shopping area not far from the Nagamachi District. 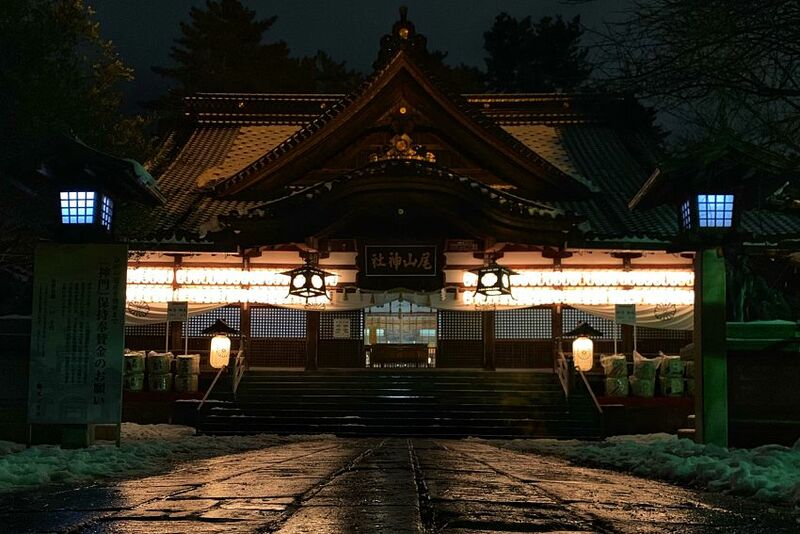 This shrine is tucked away near a shopping area in Kanazawa. Looking through the gate into the street. Our walk included another stop at Tsuzumi-mon Gate (Kanazawa Station). The light show was beautiful and we managed to get some great photos of it. That said, we wanted to return later in the evening to get some timelapse videos with the mini-tripod because capturing the colour transition of the gate would have been really cool. Unfortunately, when we returned later (around 11:00 pm) the light show had ended. 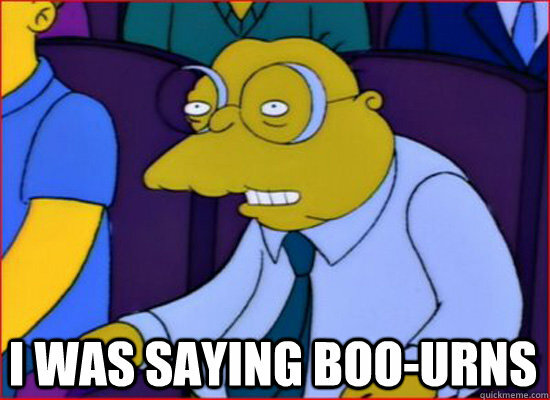 Boo-urns. 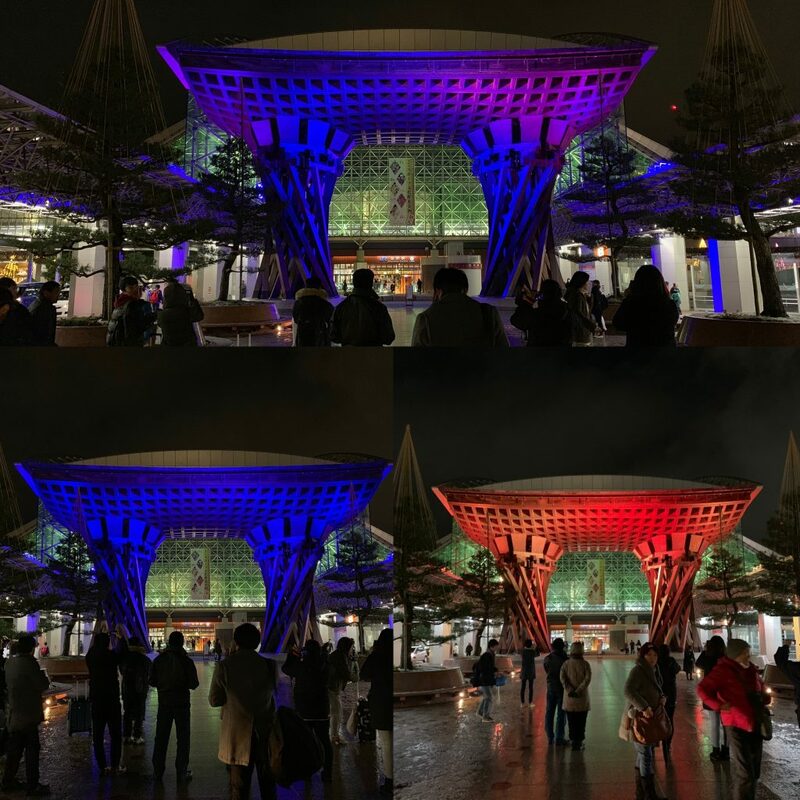 Kanazawa Station’s Tsuzumi-mon Gate in various colours. After our brief walk, we returned to the hotel to get a good rest before exploring these areas the next day. We learned that our hotel had a natural hot-spring bath on the top floor and Shyla convinced me that it would be a great opportunity to take advantage of such an amenity in the hotel. I looked up the rules for using the hot-spring and I spent about an hour upstairs before turning in for the evening. Overall, I think it was a good idea, especially since I had wet, cold feet earlier in the day. It was a completely relaxing experience. I might now be a bath person (though don’t tell Shyla). 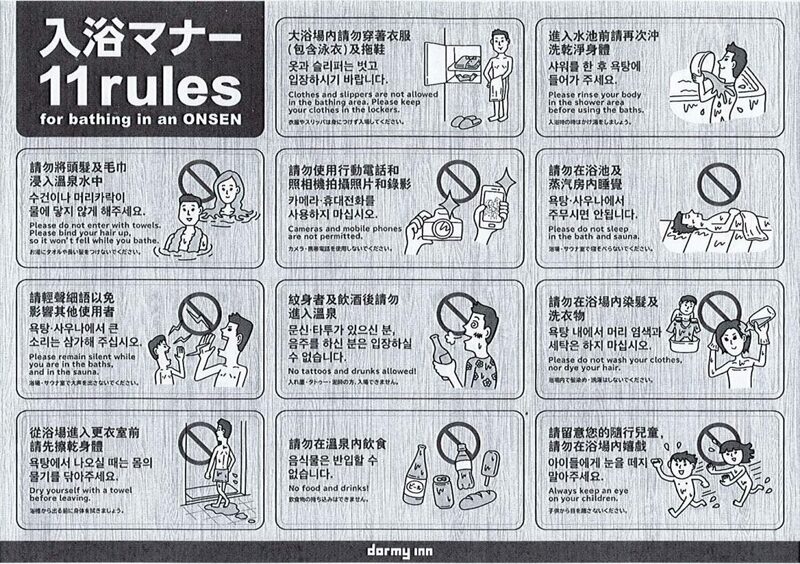 The rules for using the onsen in our hotel in Kanazawa. 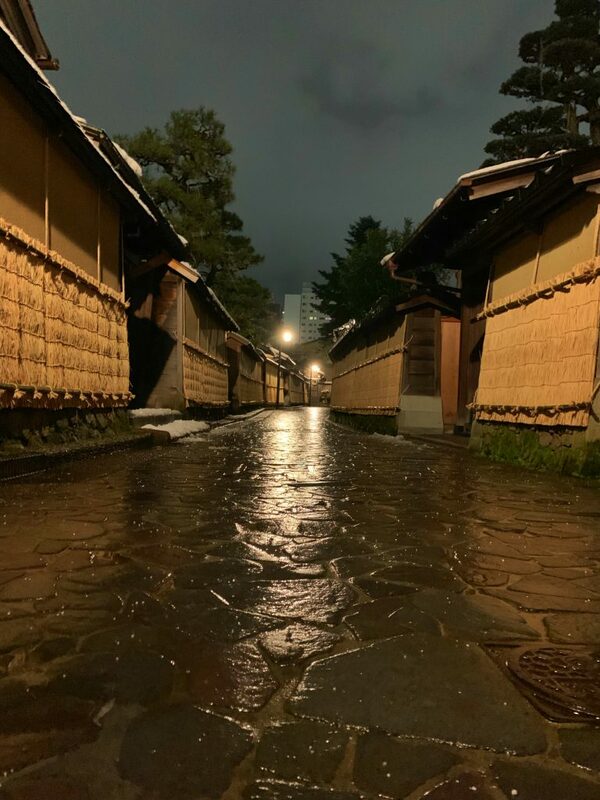 Check out the photos we took on our first night in Kanazawa here. Since we were only in Kanazawa overnight, we had to check out the next day and leave our luggage at the hotel while we explored the city. We made our way back to Nagamachi District and explored several of the small samurai houses that were open to the public. I think we visited three smaller houses before finally getting to the Nomura Samurai House & Garden. The houses were really neat and we had to take our shoes off before entering each house (something fairly common in Japan). The houses were super cold and I no doubt think this contributed to my eventual sickness in Tokyo. That said, the samurai houses were extremely interesting to explore, so it was worth the cold and discomfort. 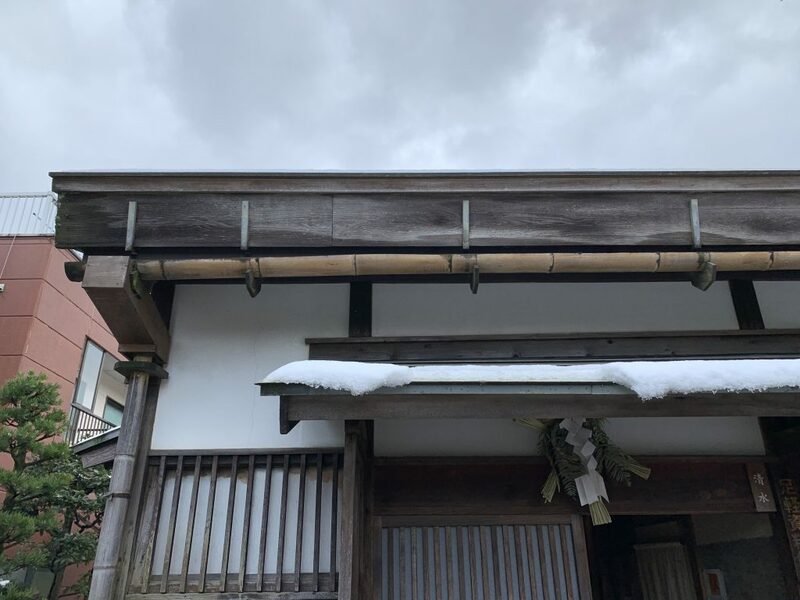 These samurai houses have bamboo eavestroughs. Our next stop in the Nagamachi District was the Nomura Samurai House & Garden, once ranked one of the top 3 gardens in Japan (2003). 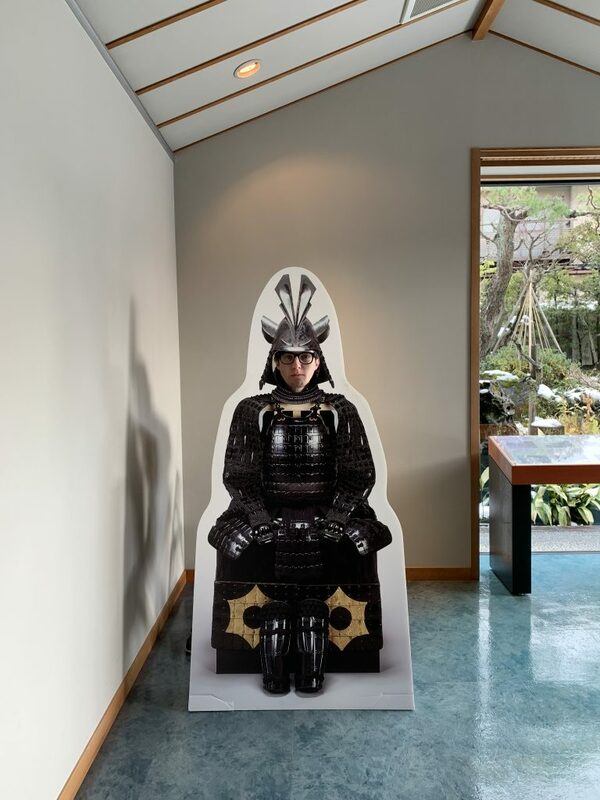 The samurai house once belonged to the Nomuras, a wealthy samurai family who served the under the Maeda family from the 16th century until the end of the Edo period. When the old social class system ended, many of the samurai houses were destroyed. The Nomura family was not immune to this and had to sell a lot of their property as well. Since then the house began to fall into ruin. 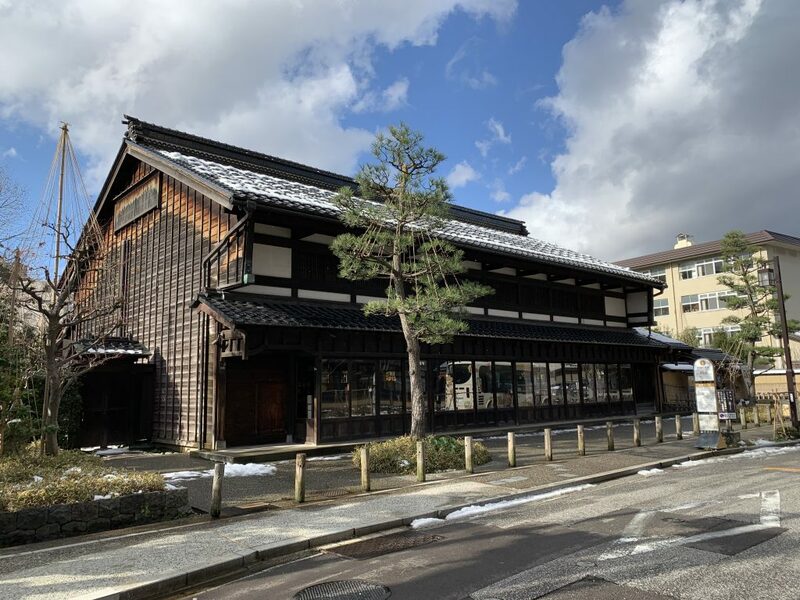 A wealthy businessman named Kubo Hikobei bought this property in the early 20th century and has since been purchased by the city and restored (source). Once again, the temperature inside this home was cold, except one of the back rooms where a number of interesting artifacts were kept. 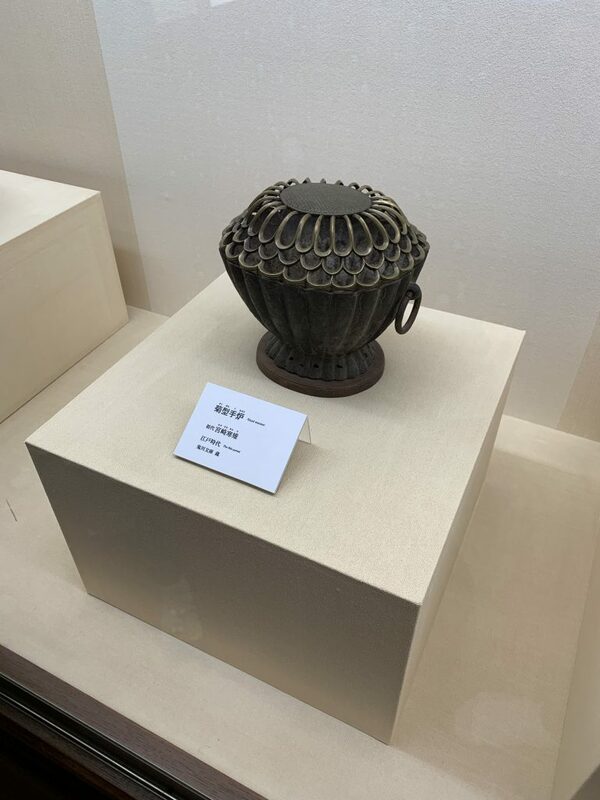 Fun fact, one of those artifacts was a handwarmer… of course. This hand warmer from the Edo Period (between 1603 and 1868). The house itself was beautiful. 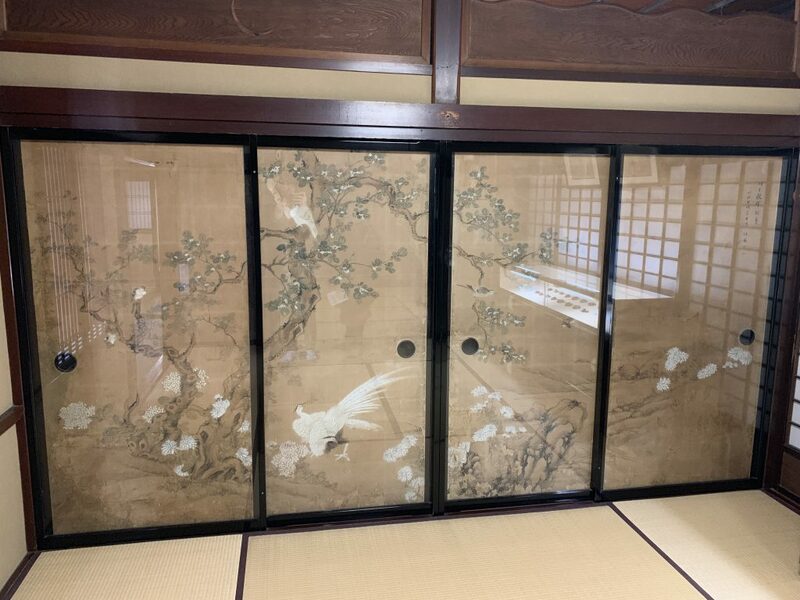 With intricately painted screen doors and wonderfully carved Ranma (carved wooden spacers above the sliding doors which allow air to flow into the room even when the doors are closed). The Ranma depicted all kinds of scenes including elephants and oxen. The painted screen doors in the Nomura Samurai House were stunning. 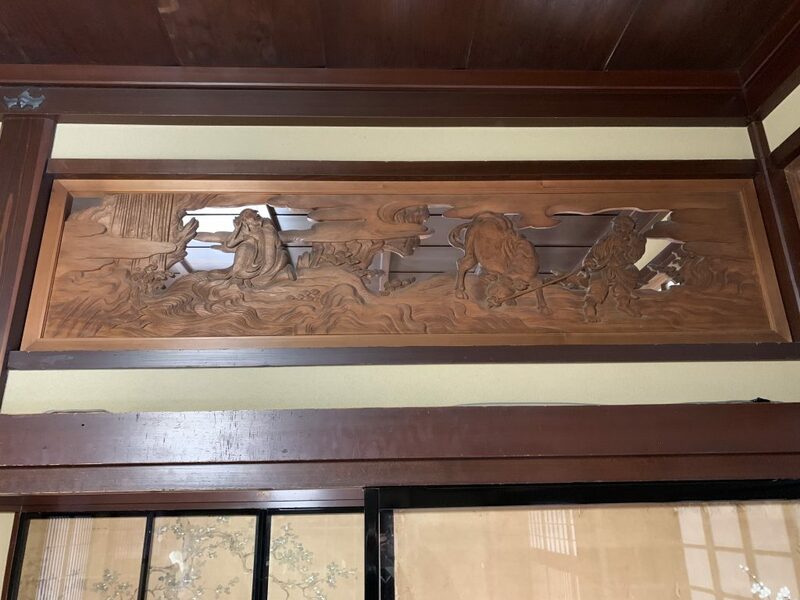 These beautifully carved Ranma which allow air to flow between rooms even with the doors closed. 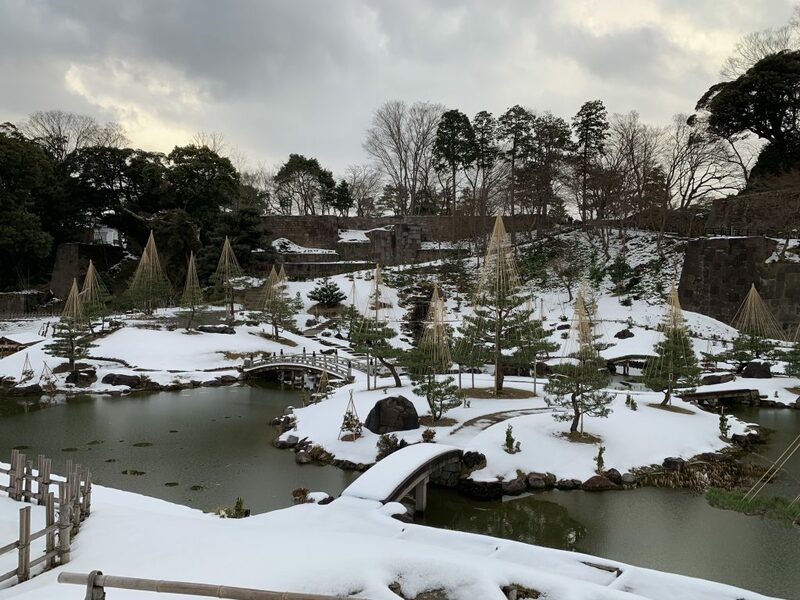 As I mentioned earlier, the garden attached to the Nomura Samurai House was once ranked as high as the number 3 garden in Japan by the Journal of Japanese Gardening Shiosai Rankings (check out my post about these rankings here). Needless to say, the garden was gorgeous. The garden at the Nomura Samurai House. This museum was really cool and it only cost ¥100, equivalent of about $1.00. The building itself was once a traditional medicine store called Nakaya Pharmacy and was established in 1579. The museum showcases the traditional culture of Kanazawa’s townspeople. 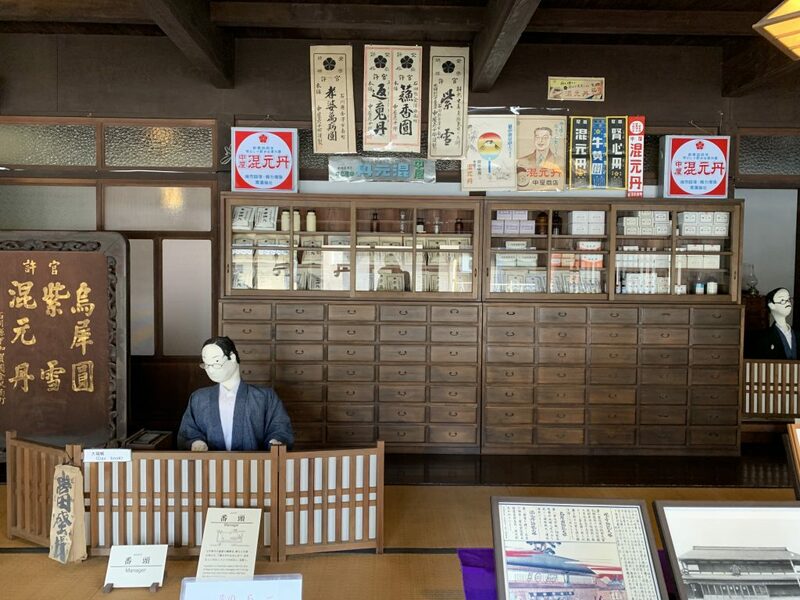 Nakaya Pharmacy and was established in 1579 and is now a museum in Kanazawa. When we entered the museum we were greeted by the nicest older gentleman. The man who sold us our tickets to this museum was so cute! He gave us a paper crane and a folded paper toothpick holder when we told him we were from Canada. In my opinion, this museum gave us the best “bang for our buck” literally. 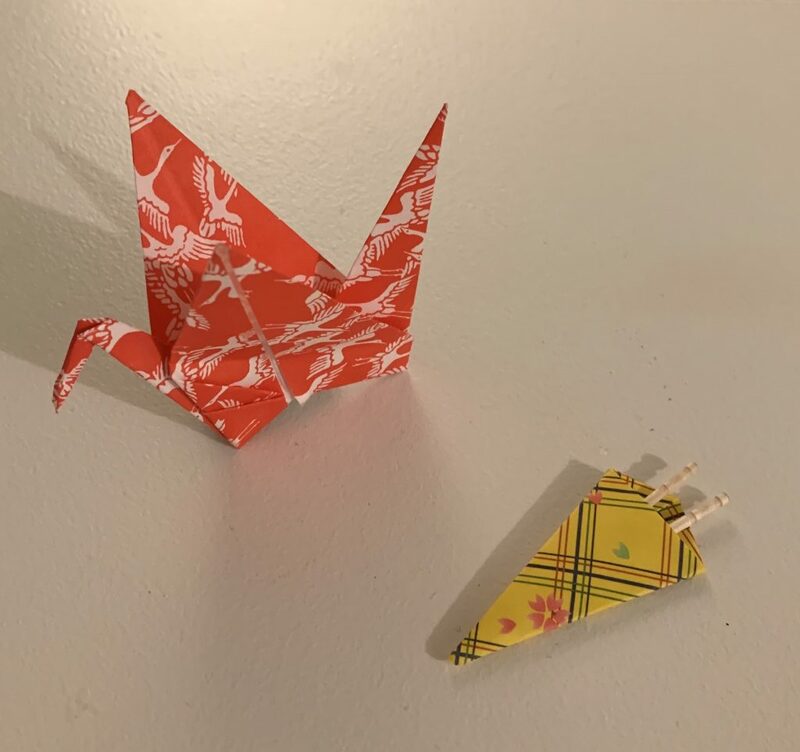 This paper crane and folded toothpick holder were given to us by the man at the Shinse Kinenkan Museum. The exhibits inside the museum we fantastic. Once you step inside, you see what a traditional Japanese pharmacy looked like. This display of how the pharmacy used to be set up. 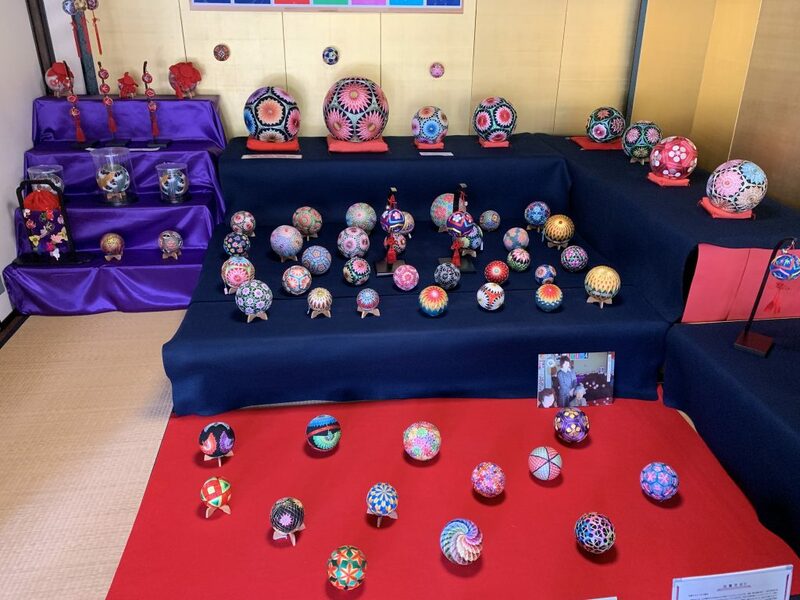 Below is an exhibit dedicated to silk handballs called Temari handballs, toys made for girls in Japan. They were used during the Muromachi Period (approx. 1336-1573). These were not toys used by the average Japanese girls though. Since they were made of silk, they were very expensive and as such were only used by girls of noble rank. Girls would compete to make new and beautiful designs. These traditional handballs were once played with by young girls in Japan. 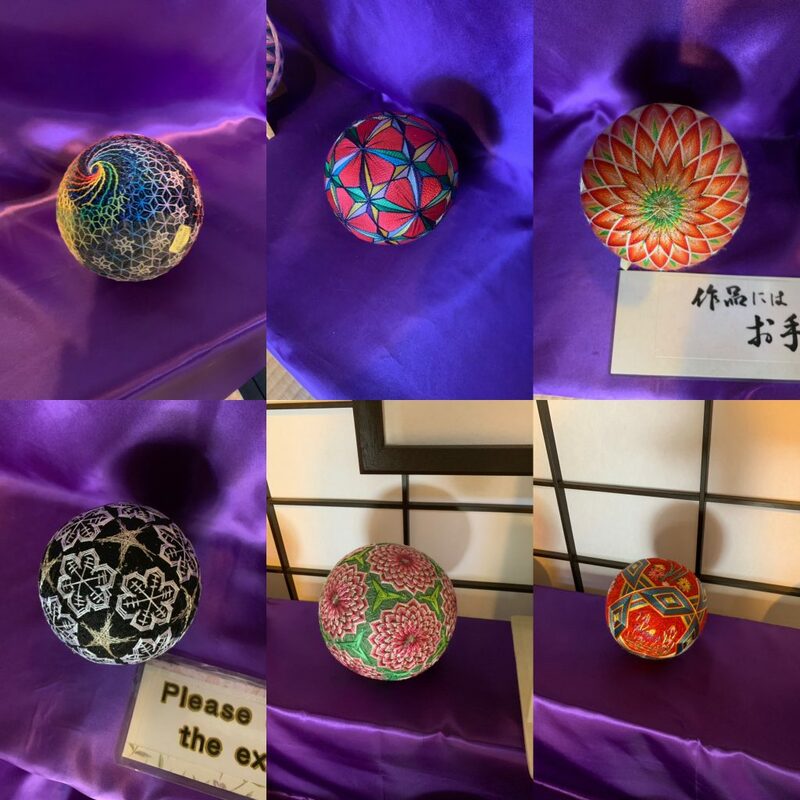 Have a look at the intricate designs of the Temari handballs on display. Which is your favourite? Close up photos of Temari handballs. 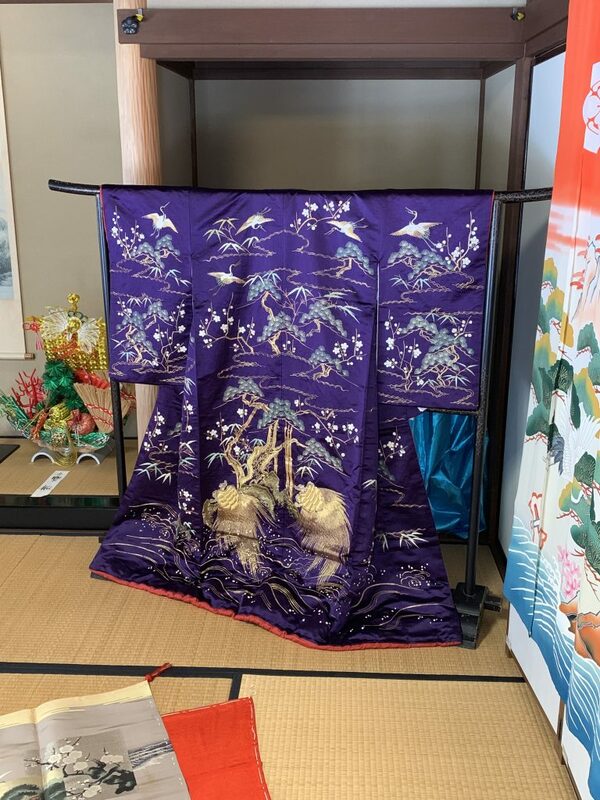 Below is a kimono that was on display. It was simply stunning. This beautiful kimono on display. This flower display is actually made of candy! It was hard to get a photo without glare but it was so cool to see! 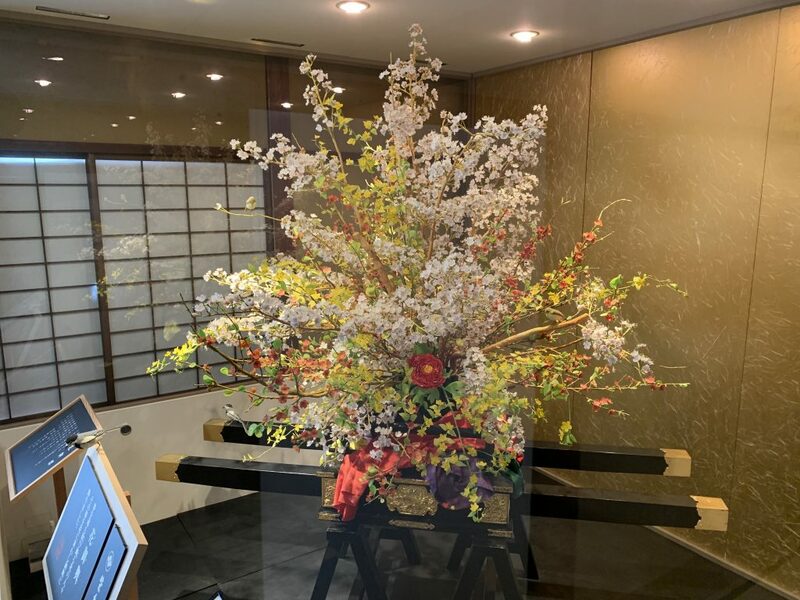 This flower arrangement is actually made of candy! With a blog titled 8 Bit Librarian, it’s hard to avoid posting photos of games. At the Shinse Kinenkan Museum, they had a couple of cool games on display. The first game pictured below required players to compete to take over each other’s flags. 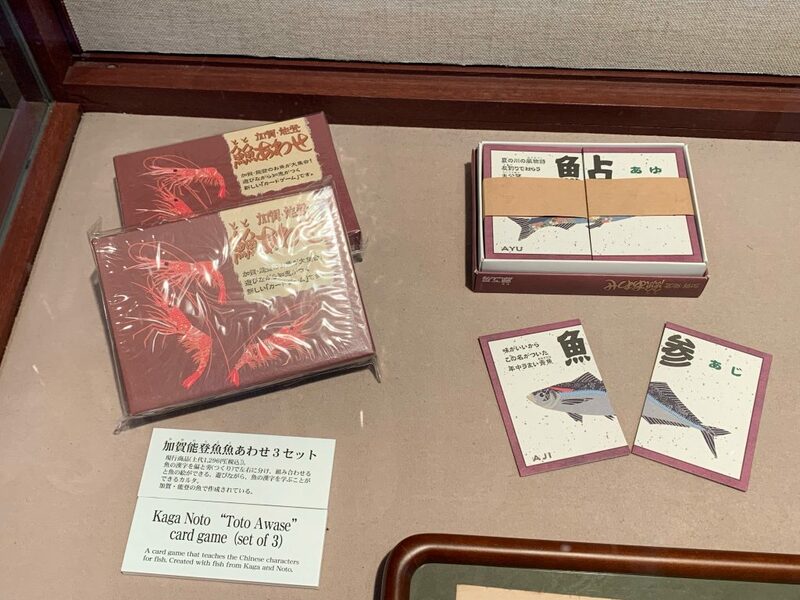 The second was an educational card game used to teach children the names of various fish. The fish game made me think of my own foray into educational game design. This game was played between two players who compete to take over the other players flags. This children’s game was used to teach them how to say the names of fish. This museum was also really cold. So once we were finished we went on the search for something warmer. Just up the road, however, we found a car parked in a driveway that truly shows how narrow the roads are (this was a small car too!). Shyla poses with a car parked along a narrow street. Our next stop was the Maeda Tosanokami-ke Shiryokan museum. 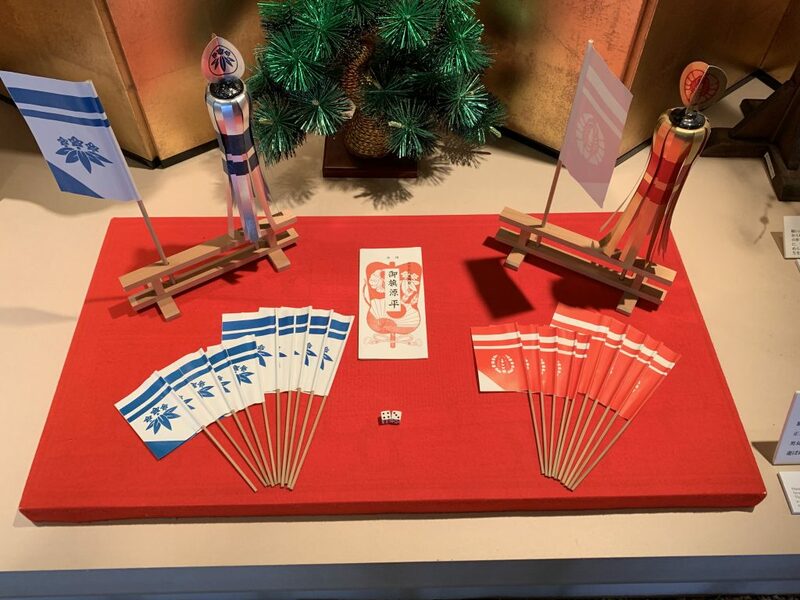 This museum explores and displays artifacts of the Maeda Tosanokami family. Unfortunately, photographs were not allowed in this museum, except in the lobby and one photo opportunity moment in the middle of the museum. Below you will find one of two photos taken at this museum. By this time we visited 3 samurai houses and 3 museums so we were getting pretty hungry. 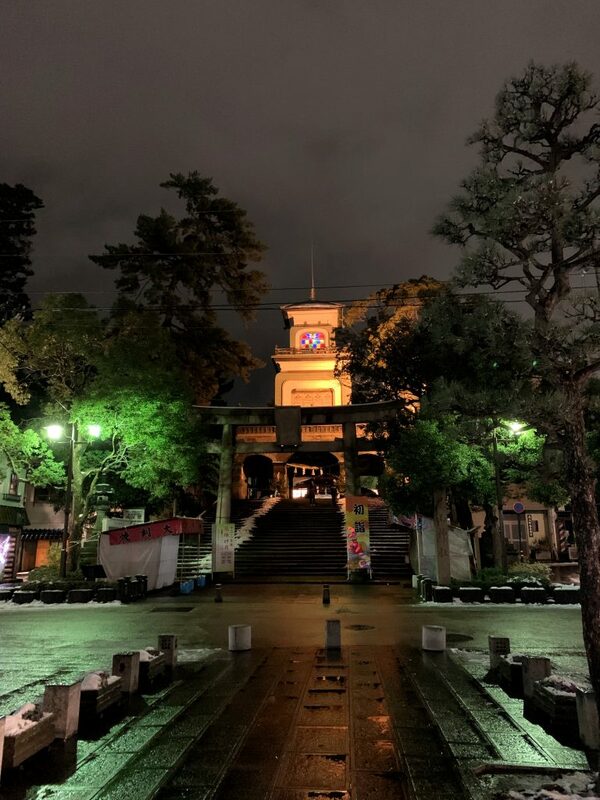 We ended up walking over to the shopping area we stumbled upon the night before because it was on our way to the next destination, Kanazawa Castle. Of all the castles we visited I felt that Kanazawa was my least favourite. I’m sorry Kanazawa! Don’t Hate me! We arrived late to the castle because of how much we crammed into our only day in the city, so we decided not to go inside. Perhaps this is why it was my least favourite castle we visited. 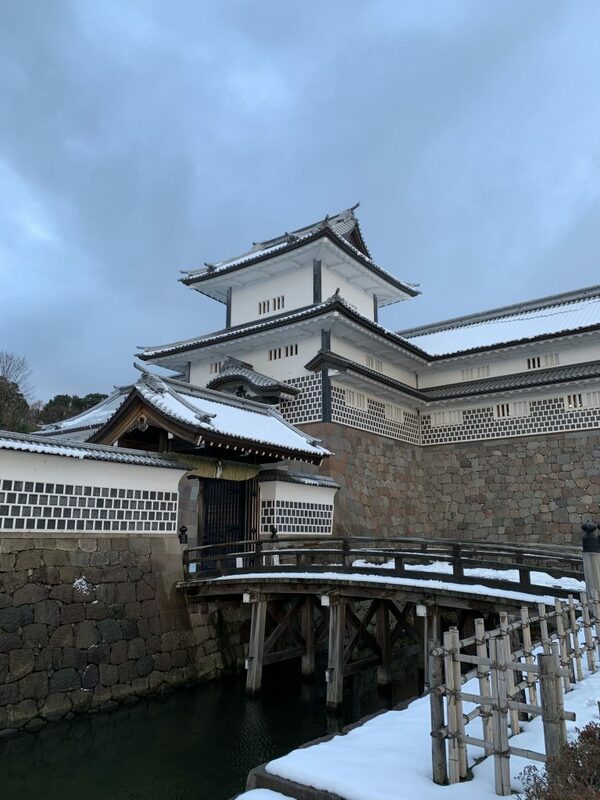 Kanazawa Castle looked beautiful with the snow on its roof. The grounds were still beautiful and everything was dusted with snow. 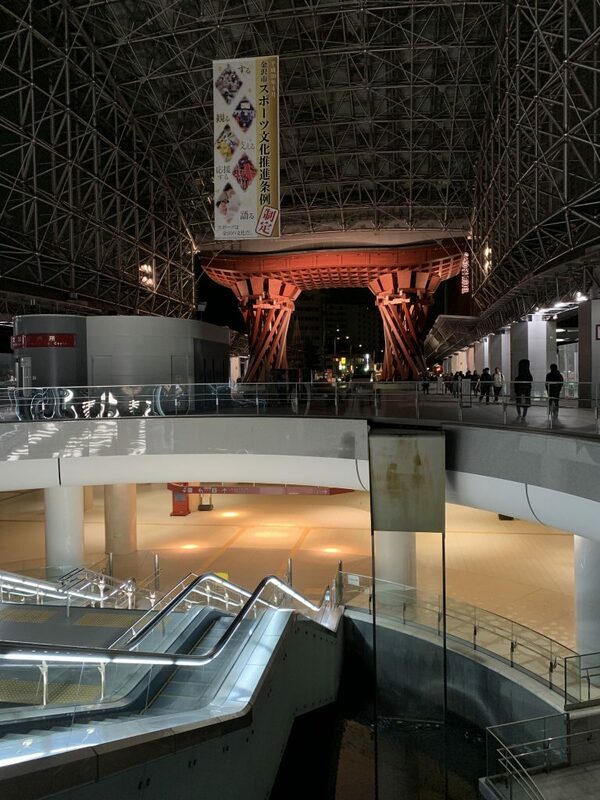 We walked around for a little bit before heading back to the hotel to pick up our bags and going to the train station to catch the 3-hour Shinkansen back to Tokyo. The train was seriously delayed and we ended getting back to Tokyo around 10 or 11 pm. We didn’t have any food at Shyla’s apartment so we picked something up at a convenience store along the way back to her place. Garden leading to Kanazawa Castle. Check out the photos we took on our only full day in Kanazawa here. I’m writing this final blog post about two weeks after returning to Canada and to be honest, it has been difficult to write. Not because my memory of my time in Japan is fuzzy, but because I miss it so much. I’m sad reflecting on the trip because it was such a good experience. There are still a number of blog posts about my experiences in Japan that I want to write because it was just so damn interesting. 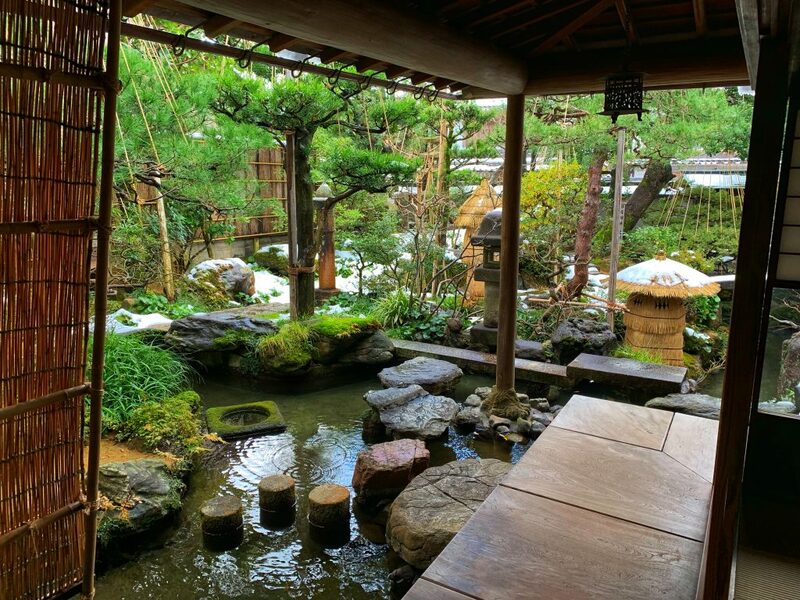 I have a post coming in the next few days about gardens in Japan. Since coming back, I realize that there is a lot of reflection that can be done on my experience. This is also a good opportunity to thank Shyla for showing me the things in Japan that she really enjoyed, because guess what? I really enjoyed them too! Fukui and Kanazawa were new places for her as well, so I am excited to have gotten the opportunity to see experience them. Thank you for your patience, insight, and fluency in the Japanese language. You definitely made the trip what it was, perfect. I already told Shyla if she is going back, she better be ready to take me with her! Joking aside, I will certainly be returning to Japan at some point in the future.